" Articles in Category: Vaping/e-cigs	"
Unprecedented chaos besetting U.S. Senate Republicans over the past week, amidst their 7-year quest to kill the Affordable Care Act, came to a suspenseful and dramatic close late on Thursday night and early Friday morning --- as the ailing Sen. John McCain joined Senators Lisa Murkowski and Susan Collins to defeat the last of the GOP proposals drafted in haste in hopes of repealing ObamaCare. At least for now. If there's one thing you can count on, Republicans will continue to treat their voters like suckers and morons. And, an insane, profanity-filled tirade of a phone call to a reporter by Donald Trump's new White House Communications Director results not in the firing of Anthony Scaramucci, but with the firing of Trump's Chief of Staff Reince Priebus. In the meantime, while Democrats, to their credit, were successful in their efforts to save health care coverage for tens of millions of Americans, their efforts to prevent the use of vaping devices, which might otherwise help save the lives of half a million Americans each year, suffers a setback as the FDA delays restrictions on e-cigarettes and yet another new scientific study finds vaping is one of the most effective ways to help smokers quit. My admission: As much as I cover the elections, especially the Presidential election, while I know who I won't vote for, and who I probably would vote for if I lived in a swing-state, I have no clue who I should actually cast my vote for in the Presidential race this year here in California! 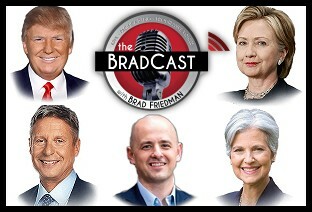 I don't endorse candidates (and, both the FCC and Pacifica Radio wouldn't allow it anyway), but that doesn't mean listeners can't! So, today we open the phone lines for advice from callers, with the question: "Who should I vote for and why?" You'll be shocked to learn that listeners have a few thoughts for me on that. 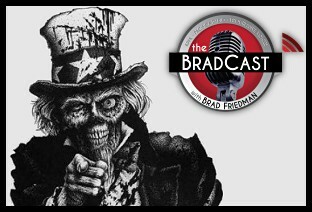 Tons of callers ring in, with some good advice, some really bad advice, and a very lively and hopefully helpful hour of The BradCast ensues in the bargain. (You may --- or may not --- be amazed at some of the reasons a few listeners offer to convince me that I should vote for Trump.) Please feel free to ring in with your own answers to that question in comments below, if you're inclined. Last night, just after we got off air, Associated Press decided to declare that Hillary Clinton had "clinched" the Democratic nomination. Their reporting was based on conversations with unpledged Super Delegates who do not actually cast their vote in the nominating process until the end of July (July 25th, to be specific), at the Democratic National Convention. So, with their misleading, inaccurate pronouncements of the Democrats having 'selected a female nominee for the first time in history' (they haven't --- yet), I offer a word or two today --- okay, a rant or two --- on the amazing disservice those news organizations have done to voters (not to mention the Clinton and Bernie Sanders campaigns, their supporters, the DNC and American democracy itself) with their inaccurate and misleading misreporting. 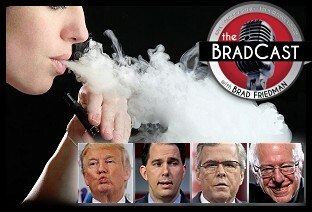 Then, I'm joined by Jonathan H. Adler, Professor of Law and Director of the Center for Business Law & Regulation at Case Western Reserve University School of Law, to discuss the strange bedfellows who've joined forces in support of onerous new FDA regulations on life-saving vaping (e-cigarette) technology. 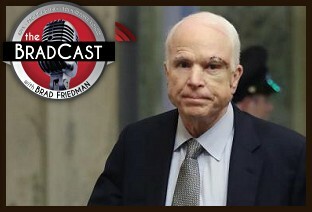 We've discussed the topic on the show on a number of occasions in the past (most recently here), not only because half a million Americans still die each year, unnecessarily, from cigarette smoking, but because, bizarrely, it has largely been Democrats and other supposedly anti-tobacco crusaders who have been leading the deadly campaign against vaping, making it much harder for smokers to quit smoking in the bargain. Why would Dems be fighting --- alongside Big Tobacco(!) --- to kill the vaping industry, despite scientific studies finding e-cigarettes to be at least 95% safer than smoking and the UK's Royal College of Physicians (the equivalent of the office of the Surgeon General in the U.S.) recent pronouncement: "in the interests of public health it is important to promote the use of e-cigarettes...as widely as possible as a substitute for smoking"? In her recent article, "Democrats Work With Big Tobacco and Big Pharma to Choke the Vaping Industry," at the American Media Institute (and at the NY Observer), journalist Monica Showalter offers an answer. She details the "strange bedfellows against vaping," citing both Big Tobacco's support of the crippling new FDA regulations, along with massive donations given by Big Pharma to big name Democrats in the U.S. Senate, just as those politicians came out in favor of restrictions on vaping. The Big Pharma companies include those which control the multi-billion dollar smoking-cessation nicotine industry that produces products such as nicotine gums, patches and, yes, inhalers! 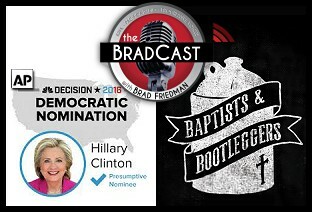 Adler, the co-author of a study titled "Baptists, Bootleggers and E-Cigarettes", joins us to explain the strange coalition, and the powerful history of the "Baptist and Bootleggers" political/economic theory, where seemingly opposing groups, such as bootleggers and religious opponents of alcohol, worked together to keep Prohibition going as long as possible in the U.S. in the early part of the 20th century. A similarly fascinating and powerful (and bizarre) political and financial coalition seems to be at work here, as Adler explains, to blunt the nascent and life-saving e-cigarette industry, despite recent studies showing, for example, "that when restrictions are imposed upon electronic cigarettes that either make them harder to get or make them more expensive, teen smoking rates go up. The idea that we could adopt policies in the name of public health that increase teen smoking rates should really be frightening." Also, what should be similarly frightening to Democrats and others who claim to be against smoking, according to Adler, is that the Big Tobacco companies have been very supportive of the onerous FDA regulations no being applied to vaping products. Those are costly new rules that Big Tobacco can afford to comply with, but Mom and Pop vaping shops, currently leading the industry in the U.S., simply cannot. "The major tobacco companies asked [for] and supported the FDA's proposals to regulate e-cigarettes," Adler tells me. "Indeed, Phillip Morris is largely credited with helping to write the statute under which these regulations were adopted." First up, it's Primary Election day again, this time in West Virginia and Nebraska (Republicans only). In WV, many voters will be forced to vote once again on 100% unverifiable touch-screen systems, though Donald Trump tells voters not to vote at all, at least until the general election. At the same time, new polling from Quinnipiac [PDF] shows Hillary Clinton virtually tied with or losing to Trump in three key swing-states (OH, FL and PA), while Sanders outpaces Clinton in each, beating Trump in all three crucial states. Meanwhile, in elections overseas, London elects its first Muslim as Mayor, though he's worried he may not be able to visit other Mayors in the U.S. if Trump becomes President and, in The Philippines, it looks as if they have elected a new President who is even more disturbing than Donald Trump. So, yes, it can happen. Then: the FDA issues insane new rules for electronic cigarette and e-liquid manufacturers which could end up killing the vaping industry that is currently helping to prevent the tobacco-related deaths of some 500k Americans each year. Chris Hughes, President of the PA Chapter of the Smoke Free Alternatives Trade Association, and owner of the Fat Cat Vapor Shop, explains the new onerous regulations and how Democrats are supporting them despite scientists and experts, such as those at UK's Royal College of Physicians who recently announced: "in the interests of public health it is important to promote the use of e-cigarettes...as widely as possible as a substitute for smoking." If the misguided FDA rules are finalized, it could cost as much as $1 million to receive approval for every single vaping product, e-liquid flavor (including each level of nicotine). The only companies likely to afford that process are the Big Tobacco companies that the bulk of the vaping industry is hoping to put out of business. In turn, millions of folks who have quit smoking by moving to vaping (which has almost none of the dangers of tobacco cigarettes) are likely to begin smoking again. "People smoke for the nicotine but die from the tar," explains Hughes, adding, "there are over 7,000 chemicals in cigarette smoke. And many of them act in concert with nicotine to make it more addictive." That is not the case for vaping products! As someone who, thanks to vaping, was able to quit the deadly habit after decades of smoking myself, this is a very disturbing development. It's made even more disturbing by the particular big name Democrats (some of the otherwise best Dems --- Hughes names names!) who support the new regulations that will only help both Big Tobacco and, as Hughes notes, "the same giant pharmaceutical corporations that make nicotine patches, lozenges and gums [and inhalers!] and view my business, and thousands of other small businesses in the country, as competitors." "This plan, if its fully implemented," he says, "will close every vape shop like mine in the United States. The only other thing we can say certainly will happen is smoking rates will skyrocket again across all demographics. There are currently over 9 million adults using these products regularly in the U.S. and those people will seek an alternative product. The alternative for them may be to go back to smoking in many instance. Half of those people will die prematurely as a result of smoking. And that's the catastrophe." While I try to contain my rage here, even in writing this item, Hughes suggests those who would like to support the effort to kill smoking by saving vaping should stop by the Consumer Advocates for Smoke-free Alternatives Association (CASAA.org). They offer a number of things you can do immediately. He also suggest you "call your representatives and tell them --- politely --- that you feel very strongly that the Senators should re-evaluate their stance on vapor products." 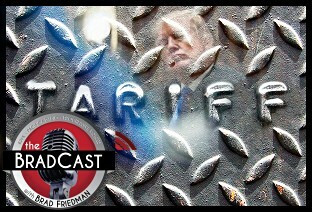 First up on today's BradCast, financial journalist David Dayen joins us to explain why the Dow Jones Industrial average plummeted 1000 points over the past two trading days, whether or not you should be worried about it, and how the U.S. is missing a golden opportunity in the bargain. 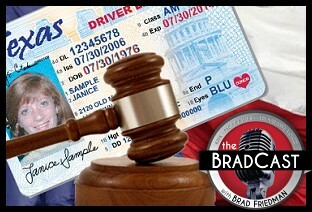 Then, BRAD BLOG's legal analyst Ernest A. Canning joins us to explain why --- even after the 5th U.S. Circuit Court of Appeals recently found Texas Republicans' polling place Photo ID voting restriction to be discriminatory and illegal (just as the lower U.S. District Court did last year and just as the federal government did well before that) --- the GOP's voting restriction is, increcibly, still in effect anyway and may serve to disenfranchise some 600,000 lawfully registered (largely Democratic-leaning) voters during the 2016 Presidential election. Canning wrote about the disturbing situation in detail last week in an article at The BRAD BLOG and explains the mess in brief on today's show: "It seems nonsensical to say a law has been struck down but it is still in force. But that's basically where we stand right now." "This law has a discriminatory impact --- it disparately impacts minorities and the poor," he says, citing the Appeals Court's latest decision. "You now have this identical finding three successive times in court dating back to 2012, and here we are in 2015 and we're having to worry about whether that discrimination is going to occur again in 2016." No, I wasn't just blowing smoke when I told you many many months ago that vaping (quitting tobacco and moving to e-cigs) is a life saver and that those who were trying to restrict its use were helping to kill people unnecessarily. A new independent expert study out this week, commissioned by the UK government's Public Health England (PHE), underscores exactly that, as we discuss at the top of today's BradCast. 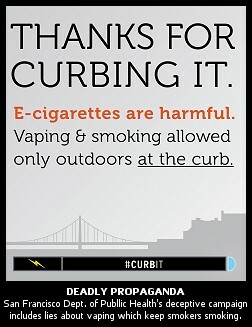 As the new study finds, e-cigs are "around 95% less harmful" than tobacco cigarettes; there is no evidence that vaping is a "gateway" to tobacco smoking; horrible reporting has misinformed the public to believe that e-cigs are as dangerous as tobacco; vaping helps smokers quit and saves lives; and that public officials (shamefully, many of them Democrats!) should be encouraging smokers to move to vaping, rather than discouraging the use of e-cigs, since they are harming the public by doing so. All stuff we've told you long ago. 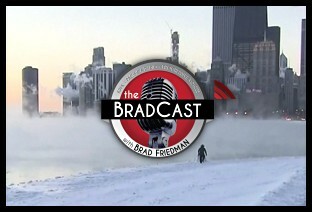 And here's another study, a major one, proving that The BRAD BLOG and The BradCast had it right to begin with. 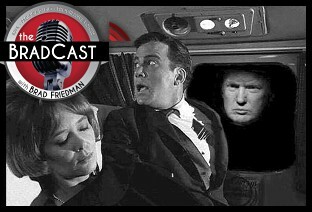 Speaking of stuff we've told you long ago, we then move back to Presidential politics and how --- as we told you on the day he entered the race in mid-June (before almost anybody was taking him seriously --- they are now!) --- Donald Trump has blown up both the 2016 campaign and the Republican Party along with it. Today's latest high-larious examples include both Jeb Bush and Scott Walker absolutely falling over themselves trying to figure out and/or flip-flop on their positions on immigration (and "anchor babies" and Constitutional birthright citizenship) and the latest embarrassment for now-disgraced Republican favorite Josh Duggar and the rest of his Republican Party. 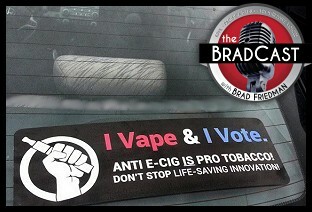 As more city and state legislatures continue to put more lives at risk by inappropriately and dangerously restricting e-cig vaping in the same way they appropriately restrict cigarette smoking, more and more professionals are speaking out against such ill-advised legislation. On am1150 in Kelowna, British Columbia last week, Dr. Christopher Nichols of California State University-Chico talked about exactly that. Nichols, who is identified by the program's host, Phil Johnson, as "a chemistry professor who analyzes the components of compounds," offers sober points during the short interview (posted in full below) which, if heard by many, could serve to help save millions of lives. After describing the differences between the dangers of smoking tobacco and the lack of dangers in regard to the vapor produced by an e-cig device, Nichols notes how those nearby someone who is vaping needn't be concerned, even as the anti-smoking industry continues to offer deadly disinformation about e-cigs. The Oxford English Dictionary named "vape" - the word used for the act of drawing on an electronic cigarette instead of a burning stick of tobacco - as its 2014 word of the year. "You are 30 times more likely to come across the word vape than you were two years ago, and usage has more than doubled in the past year," Oxford staff editors said. The apparent rise of e-cigarettes was cited as the reason for the skyrocketing use of the word, along with countless debates over the safety of using the devices long term. The word, according to the Oxford editors, was only added to OxfordDictionaries.com in August of this year. A bit slow there, chaps. All in all though, very good news --- no matter how much the tobacco and pharmaceutical industries (and their acolytes) try to undermine progress towards a vastly healthier world. 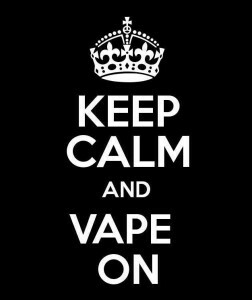 Vape on. 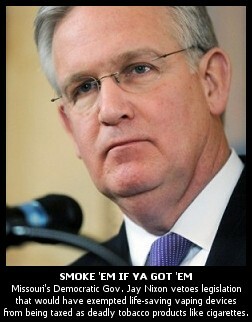 Missouri's Democratic Governor Jay Nixon had an opportunity to encourage people to quit smoking. He didn't take it. In fact, he actually made the choice to help encourage people to continue smoking, despite the fact the deadly habit kills nearly half a million people in the U.S. alone each year. 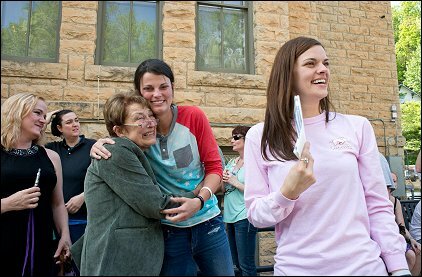 On Monday, the Governor vetoed Senate Bill 841. 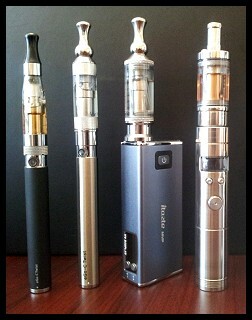 While the legislation would have restricted the sale of nicotine vaping products such as e-cigarettes to minors, and required sellers to receive a license from the state, it also exempted the non-lethal devices and products --- which are quickly becoming very popular as a method to quit smoking --- from existing laws and taxes levied against harmful tobacco products. "This bill appears to be nothing more than a thinly disguised and cynical attempt to exempt e-cigarettes from taxes and regulations protecting public health," Nixon said in his veto message. LONDON (Reuters) - A group of 53 leading scientists has warned the World Health Organisation not to classify e-cigarettes as tobacco products, arguing that doing so would jeopardize a major opportunity to slash disease and deaths caused by smoking. The UN agency, which is currently assessing its position on the matter, has previously indicated it would favor applying similar restrictions to all nicotine-containing products. In an open letter to WHO Director General Margaret Chan, the scientists from Europe, North America, Asia and Australia argued that low-risk products like e-cigarettes were "part of the solution" in the fight against smoking, not part of the problem. "These products could be among the most significant health innovations of the 21st century - perhaps saving hundreds of millions of lives. The urge to control and suppress them as tobacco products should be resisted," the experts wrote. Hope someone tells the Los Angeles City Council and Chris Christie and the New York Times and all the other yutzes out there working in knee-jerk ignorance to make it harder for people to quit smoking, rather than much easier --- and endangering the lives of millions in the bargain. UPDATE 5/30/2014: Here's the complete open letter to WHO [PDF]. In fact, the details are rather remarkable, as they speak to almost every single piece of dangerous anti-vaping propaganda I've heard since I began researching this issue.